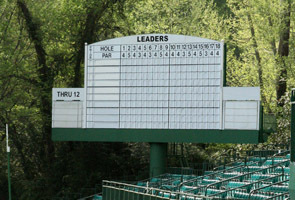 Today is the day golf fans around the world have been waiting for, the start of the US Masters which for many of us represents the true beginning of the golf season. Here we take a look at the key landmarks at this legendary venue ahead of the most hotly anticipated tournament in years. This is where it all begins for the players. The 330 yard entrance is, as the name would suggest lined by magnolia trees that meet in the middle to create a spectacular, if somewhat intimidating entrance to this most famous of venues. After reaching the end of Magnolia Lane, players arrive at Founders Circle where they’ll catch a first glimpse of the famous old clubhouse. So named due to the plaques at the base of the flagpole that towers over the circle are two plaques to honour Clifford Roberts and Bobby Jones who of course founded the club, the perfectly manicured lawn also features a flowerbed in the shape of the Masters logo. Standing at the back of Founders Circle is the famous Augusta National clubhouse. Considered to be the first cement house built in the South, it has played host to the all time greats of the game. And those that have picked up the famous green jacket will be the envy of the rest of the field, with access to the exclusive Champions Locker Room. Sitting atop the famous clubhouse, the Crow’s Nest is available for five lucky amateurs wishing to be housed during the tournament. Accommodation remains basic, with just one room featuring partitions and dividers splitting it into cubicles. 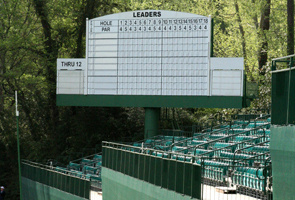 Despite the modest facilities, we imagine the views over the course must be amongst the best to be had anywhere at Augusta. As the name would suggest, this succession of three holes from 11-13 can play a huge role in deciding who gets fitted up for the famous green jacket on Sunday evening. Starting off at the with the 11th, a par 4 weighing in at a hefty 505 yards, the pond to the left of the green is ready to collect any approach shots that go astray. The 12th is a par 3 weighing in at just 155 yards, which doesn’t sound daunting enough, but when you factor in a narrow, sloping green with bunkers to the front and back, Rae’s Creek, a huge crowd and swirling winds, it suddenly seems a little tougher. 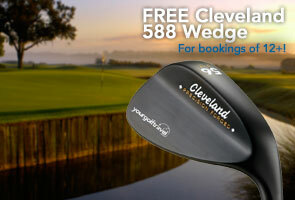 This is a par 3 that you just want to step up to, take a par and leave with your scorecard intact. 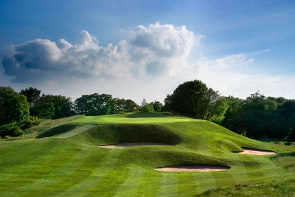 To round off the trilogy of holes making up this infamous stretch is the 13th, a 510 yard par 5 that doglegs to the left, favouring those who can draw the ball. Longer hitters finding the centre of the fairway can go for the green in two, but should be wary as a tributary to Rae’s Creek winds in front of the green and four bunkers lie in wait for those over clubbing the approach, meaning that an accurate approach is vital here. In the heart of Amen Corner lies the Hogan Bridge that the players and their caddies will cross on their way to the 12th green, as they hope to approach a birdie putt. Small and unspectacular it may be, but this is right up there with the Swilcan Bridge at St Andrews as one of the most photographed in all of golf. Located to the east of the fairway of the 10th hole, these shot to prominence last year when Rory McIlroy hooked his tee shot into the pine needles surrounding them on his final round as he lost his lead to Charl Schwartzel. There are ten cabins in total, providing lodging for members and their guests. Seven of them form a semi circle, whilst the other three, including the Eisenhower Cabin, built for President and Mrs. Eisenhower, this is a part of Augusta that is rarely shown by the television cameras, and not a place that Rory will be looking to go back to any time soon! For those lucky enough to get to walk the course observing the pros first hand, there is a guide for spectators originally written by Bobby Jones way back in 1949 to ensure they get the most from the experience. Key to these guidelines is the behaviour expected of spectators, encouraging applause and cheering for successful shots, whilst making it clear that doing applause and cheers and not appropriate for any misplays or misfortunes for players. 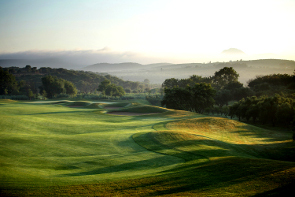 In the guide, Jones states that trekking around the course following one pair of players is not the way to go, but instead suggests planning a route around the course based on your interest and energy. Key vantage points include the back of the 2nd and 7th greens, as in addition to offering views of those holes, you’re ideally positioned to see the players teeing off at the 3rd and 8th holes. 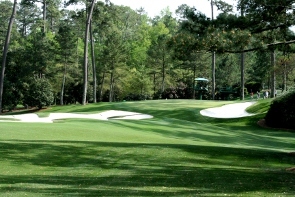 Another area that is hugely popular and will no doubt be the top of any Augusta fans list is the back of the 12th tee. From here it is just possible to see the 11th green, 12th hole and also leaves you well placed to watch the tee shots on 13. So whether you’re at Augusta or just staying up at home to watch the action unfold, it promises to be one of the most exciting tournaments in years, and here’s hoping for a British winner! 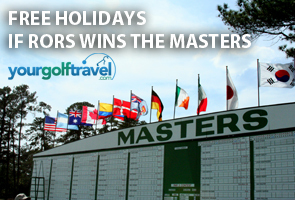 And if this has inspired you to get there next year, then head on over to golf holidays specialists Your Golf Travel who have packages available to be there in 2013. Print article This entry was posted by Tom on April 5, 2012 at 4:58 pm, and is filed under General. Follow any responses to this post through RSS 2.0. You can leave a response or trackback from your own site. The Winner (Adam Scott) – He not only managed to break his own major drought at the weekend but also the Australian curse at Augusta, sinking two of the most important putts of his career on No.18 in regulation and No.10 in the two-hole playoff.